Naga Hunters are Naga who are skilled at hunting with a bow. 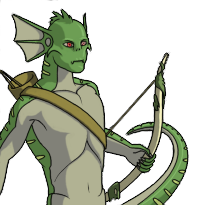 Since the naga are naturally resistant to poison, they have no qualms about hunting with poisoned arrows. These two foot long shafts, tipped with a potent poison, have been known to slay many kinds of prey. Last updated on Fri Apr 20 12:32:16 2018.